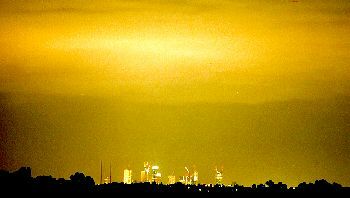 Across the whole of Victoria, from Mildura to Mallacoota, the night sky is adversely affected everywhere by light pollution resulting from careless, ignorant, selfish and wasteful lighting practices. The measured rate of increase is approximately a doubling of sky brightness every decade. This is unsustainable. If we do nothing about it, within our lifetimes we will be well on the way to all-night artificial twilight over much of the state. Through its Outdoor Lighting Improvement Section, the ASV is actively trying to stem the upward flood of waste light that is progressively destroying our view of the universe. But we will continue to lose the battle until the protests are numerous enough for the state and federal governments to take note. The following documents, especially 'Outdoor Lighting and Crime, Part 2', give guidance on why and how bad lighting practice needs to be dealt with. A source manual and resource kit entitled A RATIONALE FOR MANDATORY CONTROL OF OUTDOOR LIGHTING has been prepared by ASV member Dr. Barry Clark. This is a valuable resource for developing your own submission for control of light pollution in your area. Do your bit to raise public awareness of the impact of light pollution by measuring your night sky brightness and submitting your observations to the Globe at Night Database.